I love sea turtles. Growing up in Florida, I’ve seen them all my life. I love the way they glide over reefs or swim in the open sea. They usually dive for cover when a boat approaches, but occasionally you can get a good look at one lazing around the warm waters in the Keys. But these gentle giants were almost hunted to extinction for food and their beautiful shells. The remaining ones face an uncertain future. Now federally protected against harvesting, they still are in danger from pollution, poaching, habitat loss, and accidents. My daughter and I visited the Turtle Hospital in Marathon in the Florida Keys last week. While I loved seeing all the turtles up close, my heart broke at the reason they were there. These graceful creatures have been brought to the hospital for injuries mostly caused by man’s carelessness. Some have been hit by boat propellers, their shells split open and filled with air, leaving them unable to dive for food. Others have become entangled in fishing line, cutting off the circulation to a flipper. A few have swallowed fishing hooks so they cannot eat. Many have consumed trash that humans have negligently tossed in the ocean. Plastic bags are especially a danger as underwater they resemble jellyfish to a hungry turtle. This garbage becomes impacted in their intestines and unless it is removed they will slowly die. On top of all these issues, many of the turtles are suffering from fibropapilloma, a virus causing tumors to grow on their soft tissues. 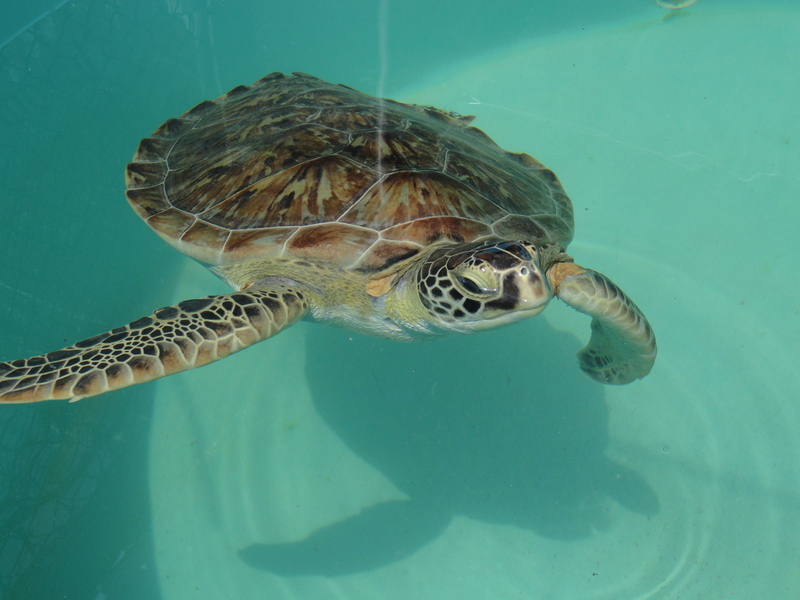 During our tour we learned how the Turtle Hospital rescues, rehabilitates, and releases its patients. Sadly, some must become permanent residents if their injuries will not allow them to be placed back in the ocean. They have a large enclosure to spend the rest of their days swimming about. The staff and volunteers at the Turtle Hospital are dedicated to caring for their charges, and it is obvious they are passionate about preventing further suffering. They strive to educate the public about how each one of us can help, especially by cleaning up our oceans. They stressed the importance of keeping trash out of the water and picking up any that you find while at the beach or boating. The very next day we were boating off of nearby Grassy Key. My daughter and I found numerous pieces of plastic bags and other trash floating all around. By the end of the day we alone had filled a small bucket with manmade debris. It disgusted us to see the callous disregard which allows this trash to be tossed in our waters. So if you are lucky enough to spend time at the beach or boating this summer, look around you. If you see trash out there, pick it up. More importantly, don’t be part of the problem. Clean up your own garbage and dispose of it accordingly. The dedicated people at the Turtle Hospital and all similar rescues will thank you for preventing another tragedy. I’m looking out my window at the bayside of Conch Key. Clouds are on the horizon, but we’re hoping to get out in the boats and explore before the rains set in. Yesterday the fishermen were cleaning their catch and tossing the remains to the fish and birds at the dock. Three nurse sharks, two small tarpon, a stingray, jacks, needle fish, parrot fish, and a cute little barracuda snacked on the leftovers. I’m constantly amazed at the diversity of life here just feet from the door. A huge manatee visited in the morning, and the stately great egrets amble over each day in hopes of a tasty morsel. I hope these creatures will be here for years to come so our grandchildren’s grandchildren can wonder at them also.